Given that the next and current generation networks will coexist for a considerable period of time, it is important to improve the performance of existing networks. One such improvement recently proposed is to enhance the throughput of ad hoc networks by using dual-hop relay-based transmission schemes. Since in ad hoc networks throughput is normally related to their energy consumption, it is important to examine the impact of using relay-based transmissions on energy consumption. In this paper, we present an analytical energy consumption model for dual-hop relay-based medium access control (MAC) protocols. Based on the recently reported relay-enabled Distributed Coordination Function (rDCF), we have shown the efficacy of the proposed analytical model. This is a generalized model and can be used to predict energy consumption in saturated relay-based ad hoc networks. This model can predict energy consumption in ideal environment and with transmission errors. It is shown that using a relay results in not only better throughput but also better energy efficiency. Next generation networks (NGN) (or 4G, as they are better known) are to provide voice, data and multimedia access to users on an "anytime" and "anywhere" basis. This vision of 4G forms the requirement to achieve high throughput, high energy efficiency and low latency to provide quality of service (QoS) and efficient utilization of the scarce bandwidth. Therefore 4G networks are expected to result in a better quality of life and environment. Another important requirement for next generation networks is backward compatibility with existing networks. In today's world, due to reasons such as cost and lack of infrastructure, it may not be possible for all to adapt new networks at once and make the existing ones obsolete. This may happen eventually with time; however, we expect to have a hybrid of the new and existing networks for quite some time. It is of high importance to have smooth interaction between existing networks and next generation networks. This intermediate period where both networks will coexist is an important step towards complete transition to next generation networks which ensures a better quality of life and environment. For developed and developing countries which have made much investment on existing networks and due to high number of users, it may take longer to completely migrate to next generation networks. However for underdeveloped countries who still lacks infrastructure the adaptation may be easy but there are cost constraints for them as well. Existing networks have many issues which when integrated into the new networks will greatly influence the overall performance. Therefore, much research currently is focused on improving performance of existing networks. This can be achieved in numerous ways such as efficient algorithms, protocol modification, new protocols, and so forth. One such example of issues is from the existing 802.11 networks where the performance of the whole system degrades greatly once low data rate nodes become dominant. A solution to address this issue comes from the advent of cooperative communication [1, 2] in the form of relay based MAC protocols. This results in intermediate data rates to provide higher throughput and capability to fight against the varying channel conditions. At MAC layer, cooperation can be incorporated by replacing slow single-hop transmission by fast dual-hop transmissions. This means that the source, after acquiring the medium, transmits to a relay first at a higher rate and the relay will then transmit to destination as shown in Figure 1 . This solution, although appropriate for the throughput, has emerged in an era when the awareness to "go green" is widely discussed. This has triggered a debate on the energy consumption which has now gained importance in the minds of the MAC protocol developers. It is important to reiterate the fact that before the ultimate phase of complete convergence to 4G networks, a hybrid phase will dominate. Relay based MAC protocols are in its infancy and most of the current literature deals with the throughput improvement gained by using these. There is only limited reporting in the literature dealing with the energy issues in relation to relay based MAC protocols. (a) Slow Single hop direct transmission, (b) Fast Dual-hop transmission via relay. Carvalho et al. 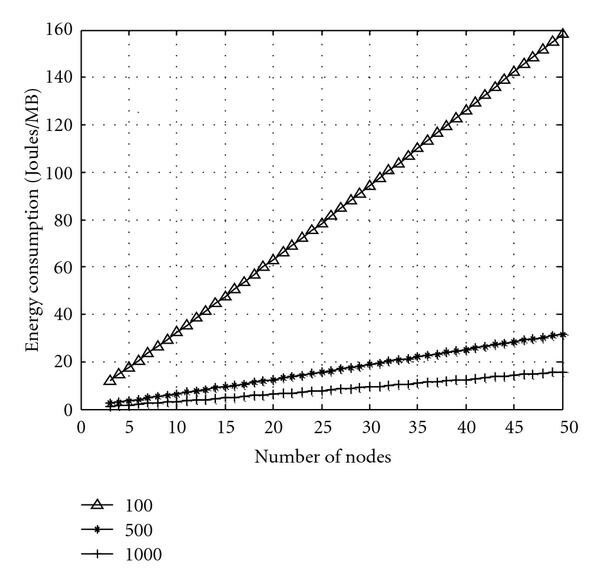 model node's energy consumption in a single-hop IEEE 802.11 ad hoc network as shown in Figure 1 . Carvalho calculated the average service time of a packet transmitted in a saturated ad hoc network. Results show that passive modes (idle, overhear, receive) dominate the energy consumption and transmission of large payloads is more advantageous. However, this model treats receiving and idle state in the same way and gives no consideration for channel condition. Wang et al. proposed a model for energy efficiency in IEEE 802.11 DCF and tried to maximize energy efficiency based on packet size and contention window. They have considered channel errors on the data packet only, which is not reflective of the real situation. Ergen and Varaiya presented a model in  for decomposition of energy consumption in IEEE 802.11. They derived the formula for the amount of energy consumed by a node in order to transmit 1 MB of data in a network with n nodes in ideal channel conditions. This model can differentiate receiving and idle states. However none of the above models are suitable for the relay based MAC protocols and they require significant modifications for the later situation. In this paper, we propose a generalized model for energy consumption and address the energy concerns of using relay based MAC protocols, as it is important to examine the impact of using a relay on energy consumptions compared to IEEE 802.11 DCF. Use of relay requires justification both from throughput and from energy perspectives. In addition to this, another concern of importance is the impact of relay nodes on the energy efficiency as relay nodes will utilize their own energy reserve to help other nodes. The main contribution of this paper is the generalized analytical energy model for relay based MAC protocols in ideal channel, channel with transmission errors and the decomposition of energy. In this paper we have used relay-enabled Distributed Coordination Function (rDCF)  as a case study to show the efficacy of the proposed energy model. Therefore it is a matter of high importance for MAC protocol developers to have an idea on the energy consumption while still in design phase. We have shown results of energy consumption with different number of nodes and rate combinations for relay links. Furthermore we have shown the impact of variable packet length (expected payload) on energy consumption. Decomposition of energy for various operations is also shown and will help in the design of energy efficient MAC protocols. This is particularly useful for devising energy saving mechanisms and policies for existing and new protocols. The energy model will benefit the application of relay based MAC protocols (e.g., rDCF) in energy critical areas such as sensor networks and integration with next generation networks. In  authors have used Markov chain model of  to show the energy consumption of relay based ad hoc networks. In this paper, we have proposed an energy model to accommodate relay based transmissions by using an improved model proposed by Wu et al. . This is a more accurate model for saturation throughput, which requires the throughput model of  to incorporate a finite retry limit. We further improve it by considering transmission errors. The following challenges have been addressed in the paper: ( ) how to incorporate relay nodes, ( ) treatment of relay node, ( ) how relay nodes differ from other nodes in energy consumption behavior, and ( ) impact on energy in the presence of transmission errors. We consider a wireless network of nodes based on IEEE 802.11 MAC that can support multiple transmission rates and supports relay based transmissions. In (5) is the energy consumed in Joules/MB. This is the ratio of expected energy (in Joules) consumed by Node in one slot to the expected data (in MB) successfully transmitted and received by node in one slot. Equation (6) gives the expression for expected data (in MB) transmitted and received by a node in one slot, where is the packet size in MB. In (5) slot refers to a transmission slot and successful transmission includes transmission by source, forwarding by relay and reception by destination. Nodes in the network are classified as active (source, relay and destination) and non active (all other nodes listening) nodes. Energy consumed in each kind of slot is the product of slot duration and power consumption in that slot. 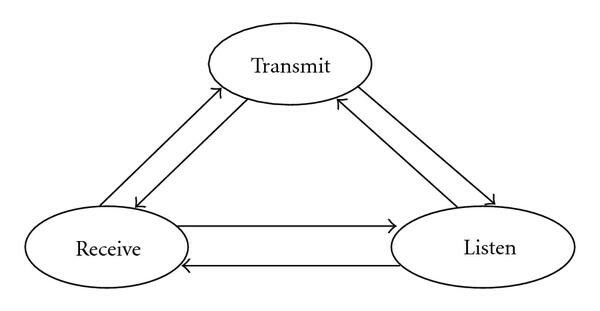 As we consider a saturated environment for this analysis, we only consider three physical states: transmit, receive and listen (idle/overhearing) as shown in Figure 2. Active nodes transmit, receive and listen during a transmission whereas non active nodes only listen to transmission. Next, we use this system model to derive the energy analysis in ideal channel and in channel with transmission errors. Based on the physical states we define operations for active and non active nodes involved. 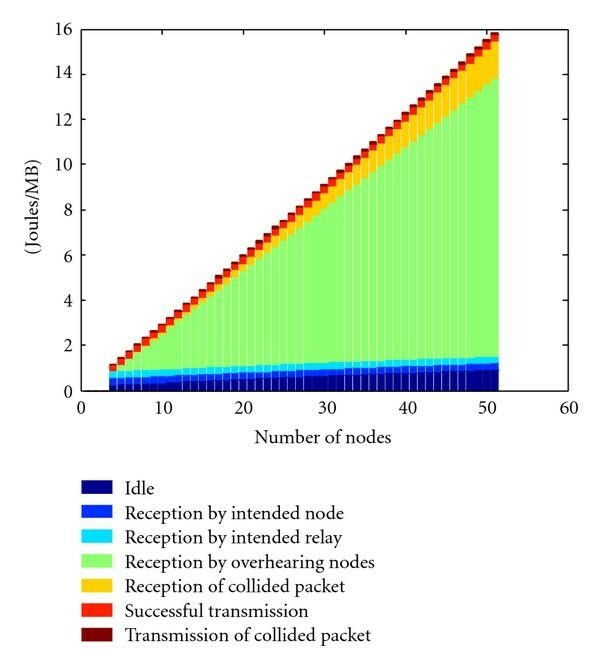 is the probability of successful reception of packet destined for Node , and is equal to ; is the probability of successful reception of packet not destined for Node , and is equal to ; is the probability of successful reception of packet destined for relay , and is equal to ; is the probability of successful transmission of a packet by Node l, and is equal to ; is the probability of reception of a collided packet, and is equal to . ; is the probability of collision on transmission of a packet by Node , and is equal to ; is the probability of idle slots, and is equal to . is successful reception of packets destined for node provided that there is a transmission free from collision and error. Similarly is the successful reception by relay with the same conditions. It is true as the relay is not involved in the contention process. is the successful reception by all non active overhearing nodes. The term ensures that only non active nodes are considered. is the successful transmission of a packet provided there is a transmission without any failure. is the transmission where there is no error and failure is due to collision. is the reception of collided packet. is the probability that there is no transmission. The numerator in (5) is defined in expression (14). As evident from the nature of relay based MAC protocols, we use control packets to coordinate relays which are followed by the data and Acknowledgement (ACK) packets. As from the operations defined earlier in this section we know that in a transmission slot we have active nodes and non active nodes. In order to model this behaviour of transmitting and receiving (active nodes) or receiving only (non active nodes) control and data packets, we formulate (7) to (11) to show the working of the protocol. To calculate the energy consumed by nodes (active and non active) (7) to (11) shown above are used in (14). For ideal scenario where we have no transmission errors, it is possible to simplify (14) by substituting . These equations are independent of the protocol. Also, , and are the power consumed (in Watts) to transmit, receive and listen (idle/overhearing), respectively. , and are the short, distributed and extended inter-frame times. is the propagation delay and is the slot time. In (7) and (8), reception and transmission of multiple packets is shown. Equation (7) gives a generalized equation for determining and , which are probabilities of successful reception of packets by relay and destination (which are active nodes). Equation (7) consists of the sum of energy consumed in receiving, transmitting and listening. Energy consumed in each of these states is the product of slot duration and respective power. Here the slot duration in transmitting and receiving of the control and data packets is the sum of their times. Where and are total number of control and data packets received. Similarly and are total number of control and data packets transmitted. The sum of , , and is the total number of control and data packets in a protocol. The same expression is used to determine , where no transmission of packets is involved. In (8) successful transmission of a packet by an active node (source) is given. 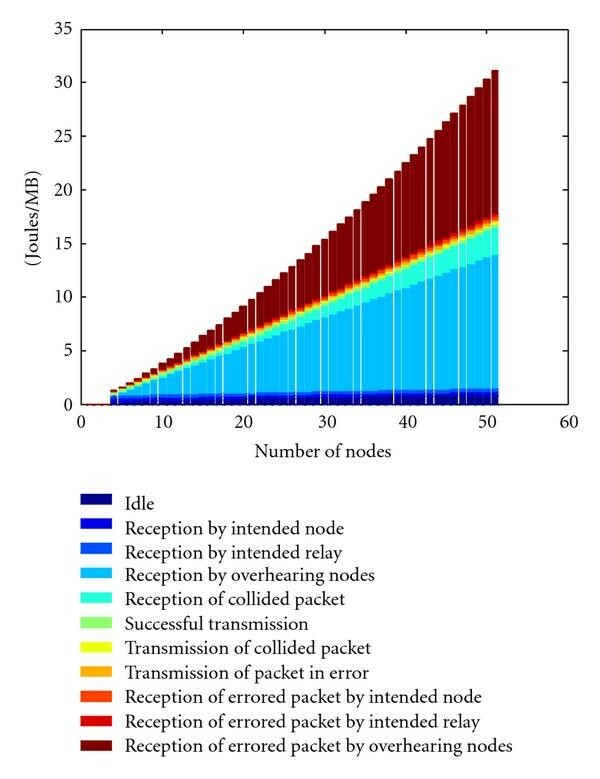 In (9) and (10), is the time for collision of control packet (initiated from source to relay or destination) and are the probabilities of transmission and reception of collided packets. Equation (11) shows the listening (idle) state as a product of idle slot and idle power. Equations (7)–(11) are for the ideal case where there are no errors and are the same as in . This set of equations represent a generic model and is used to show performance of relay based MAC protocols and can easily be adapted to cater for 802.11 a/b/g physical layers, with the parameters changed appropriately. In this section we take into consideration the impact of transmission errors on the energy consumption. Unlike collision which occurs at the first control packet, transmission errors can occur at any packet. Therefore it is important to take into consideration that even with successful reception of one or more packets involved in the transmission a failure can still take place due to one of the following packets being in error. is the probability of transmission of a packet in error by Node , and is equal to ; is the probability of reception of a packet in error by destined Node , and is equal to ; is the probability of reception of a packet in error by destined relay , and is equal to ; is the probability of reception of a packet in error not destined for Node , and is equal to . These expressions together with those defined earlier will give the energy consumption in the case of transmission errors. is the transmission of a packet in error provided there is no collision. , , and are probabilities of reception of a packet destined for Node , relay and reception of packet not destined for Node respectively. Reception of packet in error is conditioned on a transmission free from collision. The term in ensures that only non active nodes are considered. In (12) and (13), is the average time for a particular packet in error. In this case it is showing the first packet in error. For energy consumption in channel experiencing transmission errors, we define and as the probabilities of transmission and reception of packets in error. In (12) is the probability of transmitting a packet in error. Equation (13) is for determining , and , which are probabilities of reception of packet (first packet) in error by relay, destination and overhearing nodes. For simplicity we have only shown (12) and (13) for the case if the first control packet is in error. The equations become more complex for following packets being in error and are shown in the appendix. Finally the energy (J/MB) is calculated by using (6), (14) and (5). Equation (14) is the sum of the products of operations/states and their probabilities. To this point, we have shown generalized equations for the energy analysis in ideal channel and channel with transmission errors. In the following section we will apply the above energy analysis to a relay based MAC protocol. This section briefly describes the relay-enabled distributed coordination function. The rDCF was originally proposed in , where relay is used to improve the system throughput and reduce packet delay. In rDCF a high data rate dual hop path is used instead of a low data rate direct path between the source and destination as shown in Figure 1. The rDCF is based on the IEEE 802.11 DCF, but has introduced the following modifications. Backward compatibility to 802.11 DCF (nonrelay mode) and requires only a firmware upgrade. Control packets transmitted at the base rate of 2?Mbps. Modified carrier sensing scheme (shown in Figure 3). Introduction of Reservation Sub Header (RSH) (transmitted at 2?Mbps and used to broadcast duration information for the rest of packet) in DATA packets transmitted at higher rates from source to relay. Frequent broadcasting of willing lists (potential relay entries) between nodes. Relay selection based on a credit system. Carrier sensing scheme of rDCF. Considering the fact that rDCF is backward compatible to 802.11 DCF and have the same backoff scheme, we can observe that the process of channel contention and time spent in contention for each node in rDCF is the same as in 802.11 DCF. The modified carrier sensing scheme (shown in Figure 3) used in rDCF achieves better bandwidth utilization. A major advantage of this scheme compared to 802.11 DCF is that the nodes are blocked exactly for the data transmission duration. In 802.11 DCF, if the CTS is not received at the source due to collision or channel error, the neighbour nodes of the source are blocked for the whole duration of transmission which reduces the bandwidth utilization. Unlike the standard DCF, in rDCF if CTS/RCTS is not received, the neighbor nodes are not blocked for the whole duration of transmission. In the 802.11 DCF the source estimates the possible transmission rate and the duration, whereas in modified carrier sensing scheme of rDCF, the source first calculates (as all control packets are transmitted at base rate of 2 Mbps) the duration of the RRTS and RCTS/CTS transmissions only. The destination based on the received RRTS1 and RRTS2, decides in favour of the relay or to revert to the direct transmission. If the destination confirms to the source for a direct transmission it transmits a CTS packet or else a RCTS packet for the relay based transmission. The source extracts the agreed transmission rates from RCTS and calculates the duration of data packet and ACK. This information is made available to all overhearing nodes via the RSH attached to the data packet. This prevents the unnecessary blocking of nodes for the entire duration of transmission. The rDCF uses the same physical characteristics such as transmission power and Receiver Signal Strength Indication (RSSI) as in IEEE 802.11 DCF. There is no power control and both control and data packets are transmitted at maximum power. Relay transmission is intended to provide higher throughput and reduced blocking time. All the nodes maintain a willing list based on the channel quality between them and neighbouring nodes. The length of the willing list is limited to 10 entries to reduce overheads. Nodes keep updating their willing lists with better links and frequently broadcast their willing list to their neighbours. The willing list contains an entry for the credit rating of each potential relay node. This rating improves with successful relaying and degrades with inability to relay. where and are the average times channel is sensed busy during collision and successful transmission. Here RRTS and RCTS are control packets for coordinating relay-enabled transmission as shown in Figure 3. In (15), , , and are the transmission times for RRTS1 (source to relay), RRTS2 (relay to destination), RCTS and ACK, respectively. and are interframe times and is the propagation delay. and are the times for data packets of length bytes at rates R1 and R2. Due to the nature of rDCF, we must consider all the links: the link between source and relay (with probability of bit errors and distance ), the link between relay and destination (with probability of bit errors and distance ), and the link between source and destination (with probability and distance ). As a result, the probability of packet errors for the rDCF protocol and overhead caused by packet errors can be derived as (16) and (17). In (16), is the probability of packet errors, which is based on transmission of individual packets (control and data) involved in rDCF. Note that for packets following RRTS1 their probability of error is conditioned on successful reception of previous packets. For RRTS2 in (16), probability of error is based on the successful reception of RRTS1. In the same way total probability of error is based on the successful reception of all control and data packets. Probability of packet error is calculated based on the bit error probability of a particular link and length of that packet. In (17) we work out the average time spent in all the packets in error, respectively. where and . It is evident that for RRTS1 in error the time spent is shortest and for ACK in error the time spent is the highest. From (18) to (27) we have derived further parameters for rDCF. In rDCF, the total number of control and data packets is six, which is the sum of , , and . This information is substituted in (7) and (8) to derive (18) to (21) for rDCF. We make use of (7) to derive (18)–(20) for rDCF. In (18) and (19), the probability of successful reception by relay and destination in rDCF is shown. In (20), the probability of successful reception by overhearing nodes in rDCF is shown. In the same way, (8) is used for the derivation of (21), showing the probability of successful transmission by the source in rDCF. Now to address collision in rDCF we make use of (9) and (10), to derive (22) and (23). Expressions (22) and (23) show the probability of reception and transmission of collided packets by destination and source nodes, respectively. Similarly, (24) to (27) shows the probability of transmission (by source) and reception (by relay, destination and overhearing nodes) of packets in error. Further we have shown the calculation for the for the RRTS1. In Section 4, we perform rigorous performance analysis to show energy consumption, impact of change in packet length, performance under transmission errors and decomposition of energy. For performance evaluation, we assume that ( ) each node always has data to transmit and ( ) a relay is available. The results in this section are for combinations of 11 and 5.5 Mbps, denoted by rDCF ( , ). A typical set of parameters used for the evaluation are given in Table 1. In this section we will show the energy consumption of rDCF to analyze the effectiveness of proposed model. We will use it to calculate the energy consumption (J/MB) of rDCF. Equations (7) to (13) are modified according to the protocol and are shown for respective operations in (18) to (27). Expression (11) is used in existing form. Here , and are assigned 1.34 watts, 0.90 watts and 0.73 watts, respectively . Here for the ideal case . Figure 4 plots expression (14) and shows average energy consumed by each node in one slot of IEEE 802.11 and rDCF for different rate combinations. Data rates used for IEEE 802.11 is 2 Mbps and for rDCF combinations of 5.5 and 11 Mbps. Packet length of 1000 Bytes, = 32, = 5 and = 6 are used. 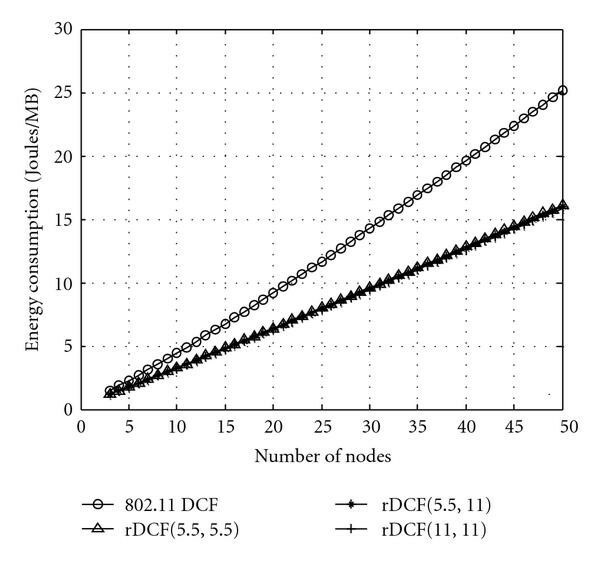 Energy consumption per slot of 802.11 and rDCF increases with the number of nodes. Average energy (J) consumed in one slot. Figure 5 plots (6) and shows average payload per node transmitted and received in one slot and is the same for 802.11 DCF and rDCF rate combinations. Figure 6 plots (5) and shows the average energy consumed in transmitting and receiving 1 MB of data at packet length of 1000 Bytes in ideal channel. 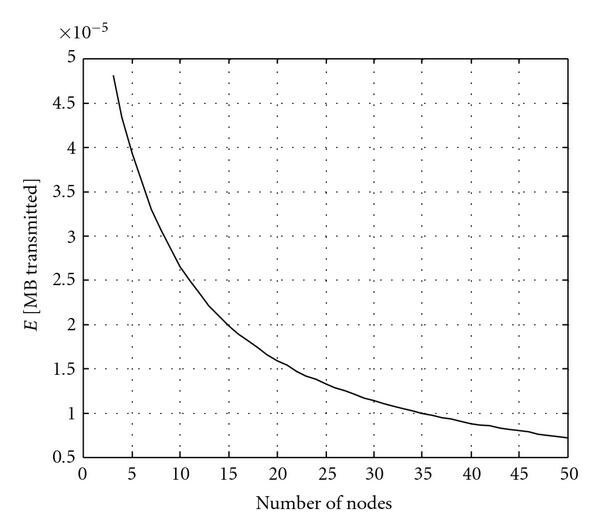 Energy grows linearly with the increasing number of nodes. As seen all rate combinations of rDCF perform in a similar fashion but rDCF (11, 11) achieves slightly higher savings. Average payload (MB) transmitted and received in one slot. Energy consumed (J/MB) for 802. 11 DCF and rDCF in ideal channel. As observed in this section, energy consumption grows linearly with node density. Therefore, it is important to analyze the performance of relay based schemes, to see the impact on energy with change in packet length and effectiveness of the proposed method. It is also important to observe the decomposition of energy to make efficient utilization of energy. The rDCF (11, 11) achieves maximum savings of 24.9% and 36.99% at 5 and 50 nodes, respectively, due to faster two hops of 11 Mbps in ideal channel conditions. This is evident from the following results that this model helps in predicting the energy consumption and it is encouraging to observe that using a relay not only results in higher throughput but is energy efficient as well. As a consequence of these results we conclude: ( ) relay based transmissions are energy efficient and ( ) relaying for others saves energy for the whole network. Since rDCF (11, 11) is the most energy efficient under ideal channel conditions, we use it for the performance analysis. We analyze the performance of rDCF (11, 11) with varying packet sizes of 100, 500 and 1000 bytes in ideal channel conditions. The rest of the parameters used are the same as in Section 4.1. Figure 7 plots the average energy (J/MB) consumed in transmitting and receiving 1 MB of data. The energy consumption grows linearly with number of nodes while the slope depends on the packet size. It is interesting to see that the results are in agreement with the findings of single hop 802.11 DCF, that is, it is still advantageous to transmit large payloads. This is true even with the doubled overhead used due to relay based transmission. Energy consumed (J/MB) for rDCF (11, 11) in ideal channel at different packet sizes. For the performance of rDCF (R1, R2) under transmission errors we consider bit error probabilities of different modulation schemes used in IEEE 802.11b under Additive White Gaussian Noise (AWGN). The bit error probabilities for BPSK, QPSK, CCK 5.5 and CCK 11 can be easily obtained from  to calculate the corresponding packet error rate. In this paper we use the two-ray ground reflection model and card specifications of ORINOCO11b in NS-2 . The two-ray ground model consists of two parts: ( ) Free space path loss for distances less than the Friss cutoff distance, and ( ) The two-ray propagation loss for distances greater than . The bit error rates below were obtained using the two-ray ground model where = 230 meters and antenna height and = 1.5 meters. We consider two scenarios: (a) for the symmetric (i.e., equal to ) and (b) the asymmetric link (i.e., not equal to ) are shown in Figure 8. For the symmetric scenario we have placed relay exactly between source and destination (i.e., = 400 m @ 2 Mbps with , m @ 5.5 Mpbs with ). The probability of errors for the direct link is (which is equivalent to a packet error rate of 8% at a packet length of 1000 bytes). Error probabilities for relay links are worked out relatively based on . Energy consumed (J/MB) for rDCF in channel errors. For the asymmetric scenario, we have placed relay closer to source (i.e., = 400 m @ 2 Mbps with , m @ 11 Mpbs with and m @ 5.5 Mpbs with ). We can observe much higher energy consumption for the rDCF (symmetric and asymmetric) in transmission errors as compared to rDCF (ideal). 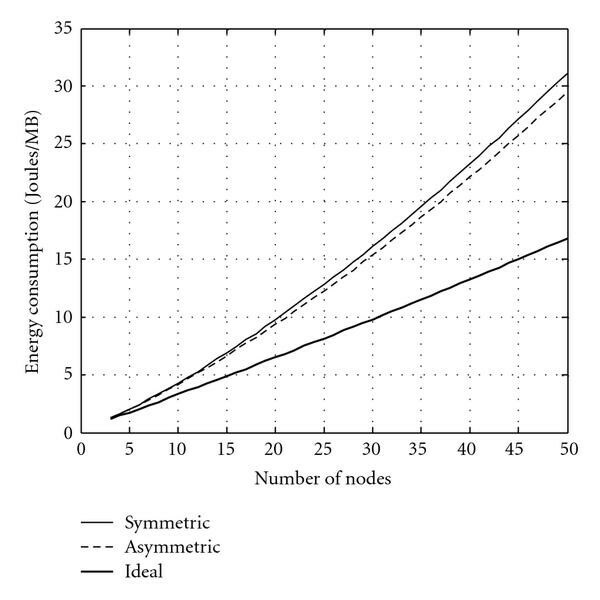 The energy consumption almost doubles for both the symmetric and asymmetric cases, whereas the symmetric and asymmetric scenarios results in similar energy consumption. The difference between the two scenarios is very small and is mainly due to the average time calculation for errors (shown in the Appendix) with different rate combinations. To show the decomposition of energy, rDCF (11, 11) in the ideal case, a packet length 1000 bytes is used. From the decomposition of energy in Figure 9, we can observe the energy consumed in various operations. The operations can be mainly classified as useful and overheads. Decomposition of energy (J/MB) for rDCF (11, 11) in ideal channel. The useful operations are successful transmission (by source) and successful reception of packets (by relay and destination). The overhead operations which waste energy are successful reception of packets (overhearing nodes), reception of collided packet, transmission of collided packet and staying idle. It is observed that the energy consumed in successful transmission and reception of data by destination and relay is almost constant. Here it is interesting to see that most of the energy is consumed in listening/overhearing by other nodes. This increases with respect to the number of nodes. In addition to this the energy consumed in receiving collided packet and staying idle also increases with the increase in number of nodes. Further to this we can see from the Figure 10 (asymmetric scenario), that overhearing is related to both successful transmission and transmission in error. It is important to see here that the energy consumption for transmission in error also increases with the number of nodes. In this the major contributor is again overhearing. Overhearing of packet in error is an increasing function of number of nodes and it also increases with the average time spent in error (i.e., for RRTS1 in error the energy consumed is minimal and for ACK in error energy consumption is high). Decomposition of energy in rDCF shows that it is possible to improve the performance of this protocol by devising a policy which can reduce the energy consumption by overhearing nodes. Decomposition of energy (J/MB) for rDCF (11, 5. 5) in channel with errors. Energy consumption of rDCF is shown in Table 2. 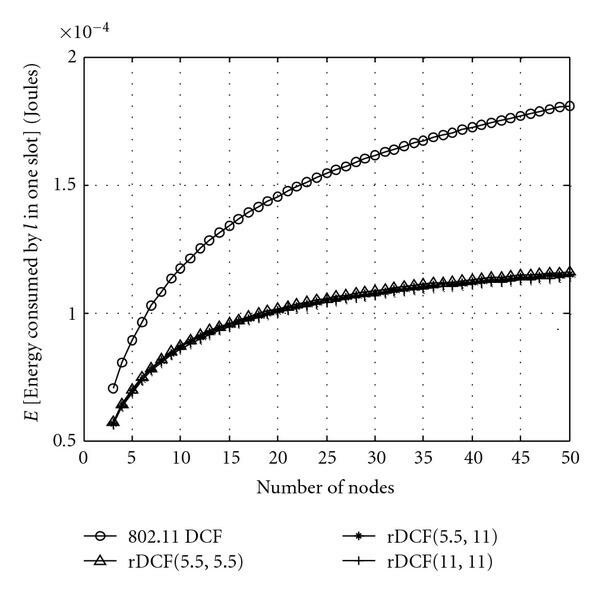 In error rDCF consumes 11.6 % and 42.7% extra energy at 5 and 50 nodes, respectively. This analysis allows us to design energy efficient protocols by predicting the energy consumption. Finally, it can be used for the prediction of energy consumption and will benefit the design of MAC protocols for energy critical environments. We have presented a general analytical energy model for relay based MAC protocols. This model assumes saturated environment and collision of first control packet only. This model is applicable to both ideal channel and transmission errors. This model can be used to illustrate energy consumption of any relay based MAC protocol with modification in accordance to the protocol flow and to cater for any physical layer with change in parameters. Further this model will help in devising energy saving mechanisms/policies based on the energy consumption behavior and decomposition of energy. We have used rDCF as a case to show the efficacy of our proposed analytical model. This model also shows the decomposition of energy for relay based MAC which is of interest to protocol designers. Extensive performance analysis for the relay based MAC has also been provided. We have analyzed energy consumption under the impact of varying packet sizes and rate combinations. We have shown that transmission errors can greatly escalate the energy consumption as it will give rise to overhearing again. Possible future work includes the extension of the above model to the unsaturated case and to obtain experimental results from real life scenario.